The Case Discussion Guide for Reflective Practice (See Appendix C) serves to structure reflective case discussion in supervision and supports both supervisor and supervisee. The Case Discussion Guide for Reflective Practice is especially useful for new supervisors to build a flow of reflective conversation without getting lost in conversation with a supervisee. This guide is also useful in preparing supervisees for sessions by clarifying what occurs during clinical supervisions sessions and setting a standard of expectation for preparation and participation in sessions. On the next page, the first of the organizers, the Bio-Psycho-Social (BPS) Framework, is presented. It is a tool used for organizing information about a person’s life situation to help reveal importation fact patterns necessary developing a clinical understanding. 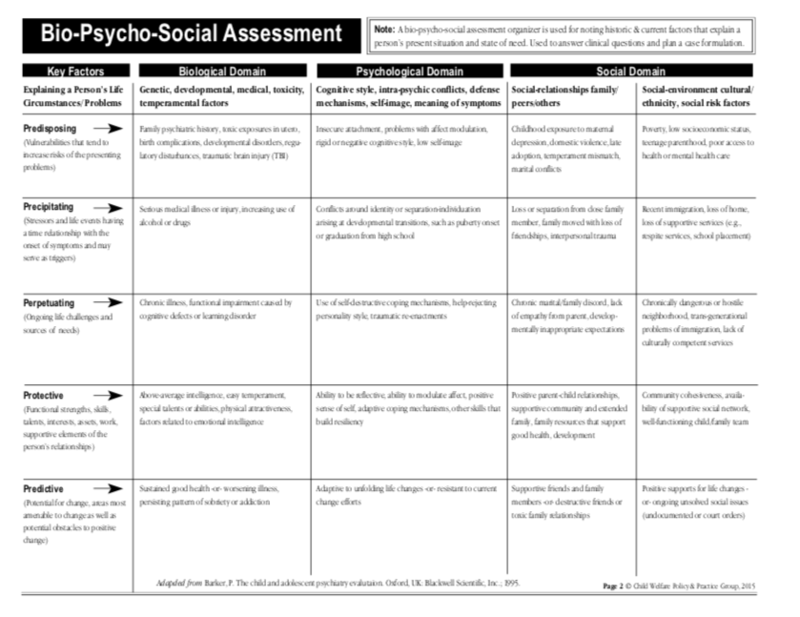 A basic biopsycho- social grid gives a foundation for gathering and organizing information about a person in services or seeking services, providing a holistic view of the person. The BPS framework provided below synthesizes data into easily understood components, called the “5-Ps”. The “5-Ps” identify Predisposing, Precipitating, Perpetuating, Protective, and Predictive Factors that each and every practitioner should know about a person’s life situation as a basis for developing a clinical case formulation, documentation, and work with a person. These “5-Ps” are applied across a person’s physical, psychological, and social history and present situation to develop clinical insights that will be useful in planning interventions, supports, and services. 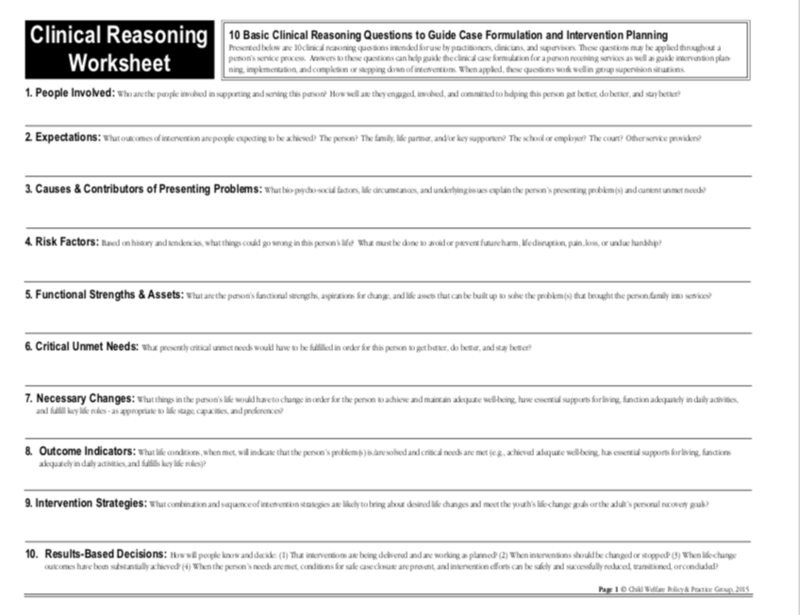 The Clinical Reasoning Worksheet works to guide supervisees towards a clinical question for the supervision session, and to organize for oral presentation of a case for supervision. This organizer is particularly suited for new practitioners. 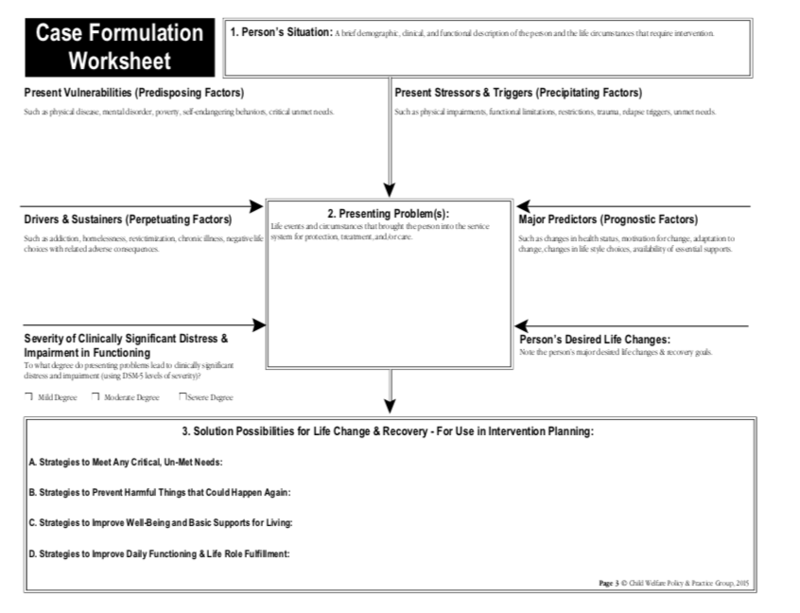 The Case Formulation Worksheet examines the pertinent factors influencing a person in services and build understanding of the whole picture of the person in context of a person’s life experience. 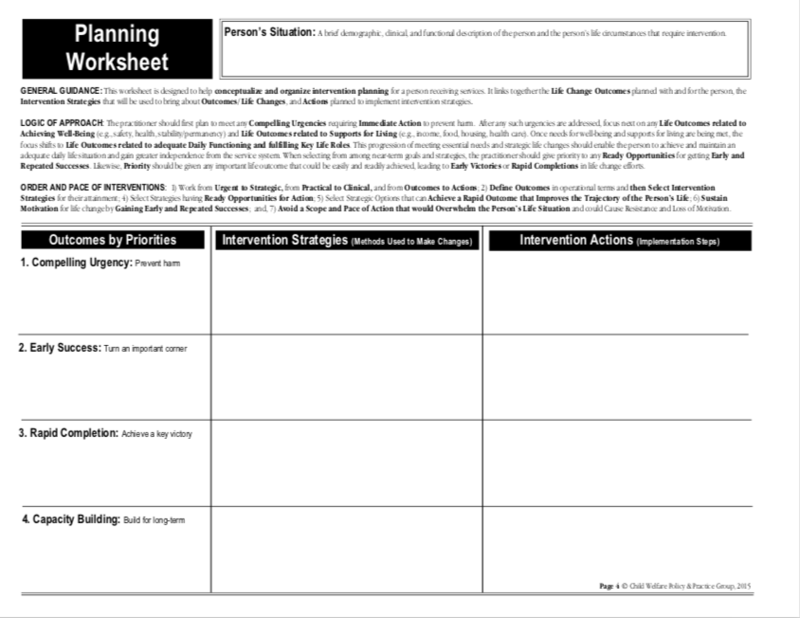 The Planning Worksheet can be used with a practitioner is “stuck” in what actions should be taken next, when there is decreased or difficulty engaging a person in services, early in the delivery of care to build rapport and trust, or to organize and deconstruct actions in response to crisis or an emerging crisis.